Cathie and I both agreed that Shrimp would be the main ingredient. We also agreed to combine it with Pesto. I had fresh Cilantro and Basil waiting to be dealt with, knowing that unless something was done and right now, there would be no tomorrow. At $3.99 a bunch it’s criminal to see Basil go bad overnight. Naturally I opted for Pasta, while Cathie was happy with a green vegetable. With something as simple as grilled Shrimp, there’s no problem with “to each one’s own”. 1. In a small skillet, toast the Pine Nuts, shaking the pan occasionally, until golden brown, about 2 minutes. 2. In a food processor, pulse the Pine Nuts with the Basil, Cilantro, Garlic & 1/2 cup of the EVOO until combined. Add the Pecorino Romano & pulse until smooth. Scrap the Pesto into a bowl & season with Salt & Pepper. A squirt of Lemon Juice is optional. 1. Bring a large pot of Salted water to a boil. Add the Spaghetti. Boil according to the package instructions, about 12 minutes. 2. Drain place in a bowl & add the Pesto, according to your taste. 2. Preheat a cast-iron grill pan. Thread the Shrimp on 4 skewers. Grill over a medium-hot heat, weighed down with a grill press, until opaque & cooked through, about 1 minutes on one side, 1 minute on the other. 3. 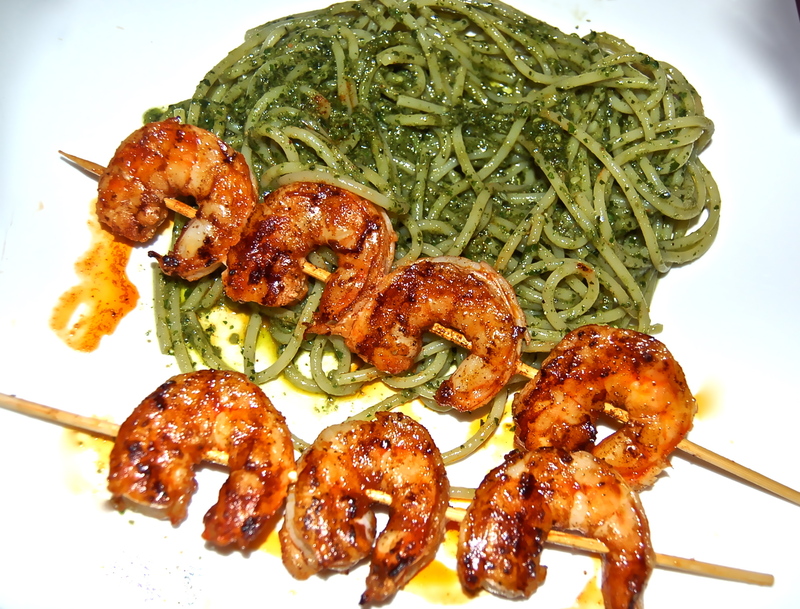 Top the Pesto Spaghetti with 2 skewers of the Shrimp.